Researchers have known for a long time that alcohol consumption is quite concentrated in a small part of the population. They argue about the exact distribution, but there is substantial agreement that, so long as alcohol sales are not heavily restricted, consumption is distributed in a quite predictable way. That is, there are many light and moderate consumers, along with a long tail of those drinking at heavier levels. In Australia, the top 20% of the drinking-age population in 2013 consumed around three-quarters of all the alcohol consumed. The top 5% consumed more than a third. The concentration of alcohol consumption among the heaviest drinkers has actually increased in recent years. The top 10% of consumers accounted for 49% of the consumption in 2001, and this had increased to 53% in 2013. The heaviest-drinking 20% of the population reported consuming a daily average equivalent to 43 grams of pure alcohol – a bit over four standard drinks. This is a substantial underestimate of their actual drinking. The total amount of drinking reported in such surveys is calculated to be about 55% of the alcohol sold in Australia, so their actual daily average is likely to be about 7.8 drinks. This is nearly four times the low-risk limit of two standard drinks per day recommended by the National Health and Medical Research Council. If you drink enough alcohol, you get intoxicated, making you unfit for a lot of everyday activities. This includes, for instance, driving a car, most kinds of work or looking after children. Apart from these issues of injury and social functioning, alcohol also carries longer-term health risks. At an average of four drinks per day, the chances of dying of an alcohol-related cancer or other chronic disease are four in 100 for men and 4.5 in 100 for women. At 7.8 drinks a day, the chances are about five in 100 for men and eight in 100 for women. Adding in risks of dying from alcohol-related injuries more than doubles the risk for men, and increases the risk for women by more than 50%. Just considering the risks of health and injury harms, alcohol is by far the riskiest commodity that a majority of us regularly consume. The current guidelines “to reduce health risks from drinking alcohol” set upper limits calculated on lifetime death risks from drinking. These are around four times the rate National Road Safety Strategy aims for as an upper limit of lifetime rate of deaths from traffic collisions. They contrast, for instance, with the National Health and Medical Research Council (NHMRC) guidelines on water safety, which aim to keep the risk of death from contaminated drinking water below one in a million. Those in the business of selling alcohol have long known about the skewed distribution of alcohol consumption in the population. In meetings among people in the industry, those at the top end of the distribution are called the “super consumers“, and they are vital to maintaining or increasing sales. If all the “super consumers” reduced their drinking to the two-drinks-a-day average recommended by the NHMRC as an upper limit, it has been calculated, based on self-reported consumption, that alcohol sales would fall by 39%. 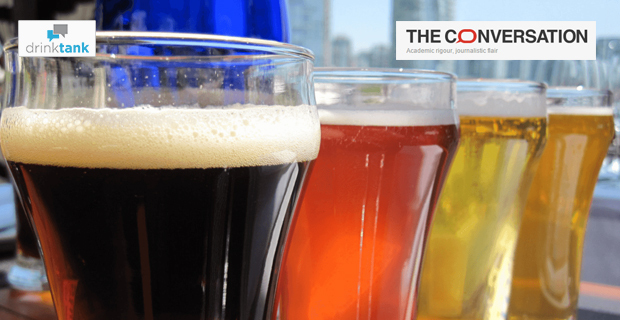 In its public face, the alcohol industry takes the line that it is only seeking to protect and promote “responsible drinking”: how to “drink properly”, minimising risks of harm. But, in its internal discussions of the need for retailers to “identify and target super consumers”, the industry is acknowledging a large part of its sales are to drinkers who are taking substantial risks with their own lives and the lives of those around them. If all drinkers in Australia were to drink within the government guidelines for low-risk drinking, the alcohol market would shrink substantially. If governments want to reduce alcohol-related harms, they can’t rely on the industry’s commitment to responsible drinking. It’s directly against the industry’s interests for the heaviest drinkers (who make up the majority of their sales) to drink less. Given this inherent conflict, policymakers should focus on well-evaluated policies such as reduced late-night trading hours for pubs and nightclubs and smarter taxation of alcoholic products. Most importantly, governments should be sceptical of working in partnership with an industry whose interests are diametrically opposed to public health. This post first appeared on The Conversation. View the media release and research report. The AFL and NRL are being used as a highly effective conduit for mass alcohol marketing during children’s TV viewing hours.